As tech events evolve, there are three emerging trends that stand out: diversity, charity and accessibility. This year as companies interweave these initiatives into their work culture and values, here's why -and how- you'll be seeing these three big trends in the 2019 tech events you attend as well. With the immersion of distinct cultures and perspectives throughout the tech industry, innovation extends beyond tech itself. Considering the financial boom in the tech space and the importance of engagement for consumer buy-in, companies have started encouraging charity work and volunteer services as a means of getting involved with their communities. Moreover, tech events provide the perfect outlet for companies to demonstrate their generosity while engaging with the community. However, for those not involved in tech, it's difficult to communicate the evolving nature of technology and it's importance to the masses. To counteract this, there has been an increase in education and business themed events to encourage both inexperienced and non-technical people to grow within the tech sphere. Tech events are expanding their audiences by introducing simplified, educational seminars or interactive competitions to get all parties involved in the tech community. Companies are being celebrated for equalizing opportunity, and many are reaping the benefits of having a diverse perspective. GM for instance, have both seen success after appointing female CEO Mary Barra. The Washington Post reports GM claims of Barra, "she is a leader in the company’s ongoing turnaround, revitalizing GM’s product development process, resulting in the launch of critically acclaimed new products." Diversity in tech events isn't limited to gender. Diverse groups like the National Society of Black Engineers, and MAES, which provides resources for Latinos in Science and Engineering, are growing exponentially in members and events. A more diverse workforce leads to higher revenue and increased creativity. If properly implemented, diversity and inclusion efforts could net the IT industry an extra $400 billion in revenue each year, according to CompTIA CEO, Todd Thibodeaux. Keeping this in mind, tech companies are extending their efforts to implement diversity cross functionally; and events are a big part of their effort. Large event organizations and conferences like the 2019 Women in Tech Conference have grown in popularity and expanded across borders. Women and people of color (POC) in tech are being celebrated more and more through various award ceremonies such as InnoTech Women in Tech Summit, and Tech in Motion’s Timmy Awards. 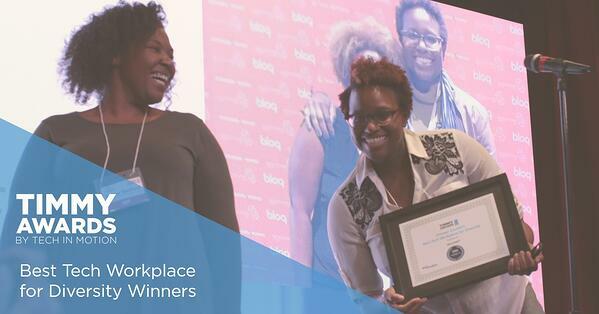 The Timmy Awards by Tech in Motion honor the Best Tech Workplace for Diversity, and is awarded to companies who implement diverse hiring practices, promote collaboration, and provide tools and resources to explore and celebrate differences. Companies in the tech space are starting to make volunteer work and community involvement a priority. Service projects are a great option for team building and on the clock stress relief for hard working employees. According to an article published by Fortune, "giving back is associated with greater employee retention, higher levels of brand ambassadorship on the part of workers and more enthusiastic employees." The benefits of giving back have extended into both corporate and public events. Many companies have implemented internal volunteer work, but some have started opening up these opportunities to the public, as well. Classy reports that organizations like the Robin Hood Foundation have successfully increased donations during their annual gala by expediting the donation process using Salesforce. Motion Recruitment recently launched a program devoted to community service throughout their twelve cities of operation to tie into tech events and beyond. With their initiative, Motion Cares, a team in each city participates locally in charitable events and activities such as hosting toy or food drives or volunteering at the local food bank. One of Motion’s brands, Tech in Motion Events, is also seeing success just months after the initiative launched by tying in those charities to specific events. Tech in Motion: Philadelphia for example, held a “Techsgiving Networking Mixer” in which guests had the opportunity to bring a donation to Philabundance, Delaware Valley’s largest hunger relief organization, in return for a free drink. One of the biggest emerging trends in tech events is possibly one of the most important – increased public access. In recent years, tech events have shifted from exclusive conferences for personnel only to public events including whole communities and even school districts. Some tech events have even started to reach into the business sector, making it easier for entrepreneurs to collaborate with tech investors and contractors. As technology becomes a necessity for both business efficiency and competitive employment, accessibility and knowledge are progressively valuable. Increasingly popular are events that focus on improving public knowledge of the tech space by spiking interest in STEM programs through competitions and games like hackathons and pitch-offs. As interest in educating young children, college students, and women grows, several tech event series specialize in STEM projects and initiatives. The overarching goal is to develop a more inclusive culture around technology, especially by encouraging young girls to consider a technically focused college education and career. 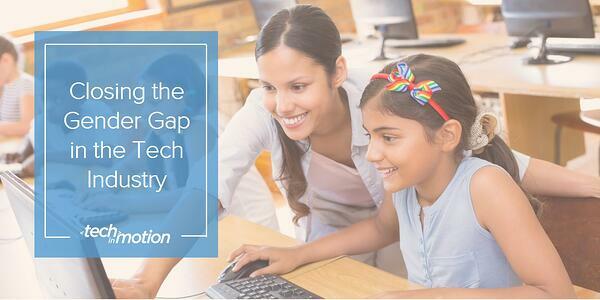 Hopefully, inclusive education initiatives will serve to close the undeniable gender gap in the tech industry. Beyond exposing students and underrepresented groups to the tech space, companies are also using the events platform to implement training and give participants the chance to experience what a career in the tech space could be like. Some companies even take teams of technologists and recruiters to college campuses for hackathons, like Disney did at Georgia Tech earlier this year. Although companies recognize the need for a more integrated approach to tech in schools and training programs, they haven’t forgotten about the need to implement technology into entrepreneurial planning. Startup and entrepreneurial events like conferences and pitch tanks have served to connect new businesses to tech talent, investors, and business partners. As the popularity of these events grow, organizations that focus on hosting these meetups have sprouted up and spanned their events from annually to monthly. They’ve gained credibility and media attention, as a majority of people in the tech and business worlds have them on their radar. In the past few years the tech industry has transformed, and tech events have evolved accordingly. Although once exclusive and seemingly untouchable, the tech space has grown into a competitive career choice, increasingly accessible to those willing to learn regardless of background and culture. 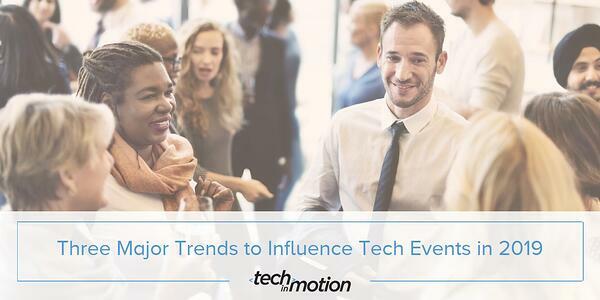 Can you think of any other emerging tech event trends? Leave a comment below! © 2013-2015 Motion Recruitment Partners LLC. All rights reserved.